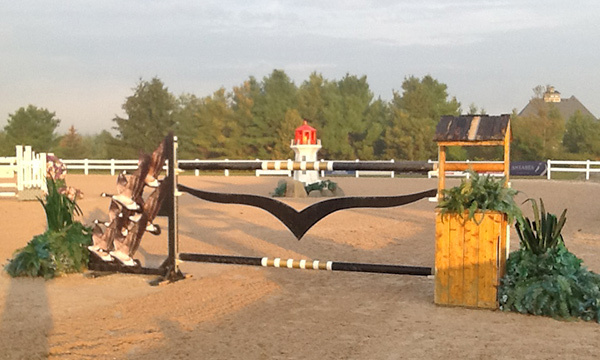 Welcome to Caledon Pan Am Equestrian Park and the Autumn Classic. 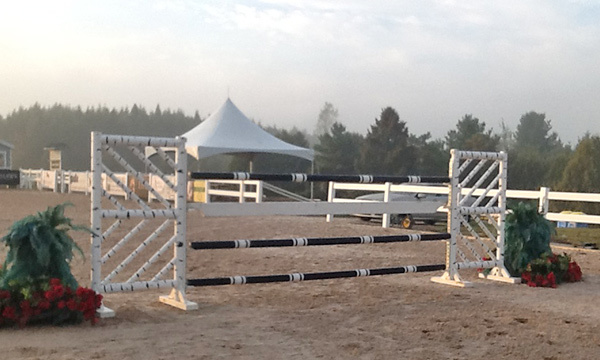 Today we host the Ram Equestrian 1.40m Grand Prix and the prize money is $25,000. 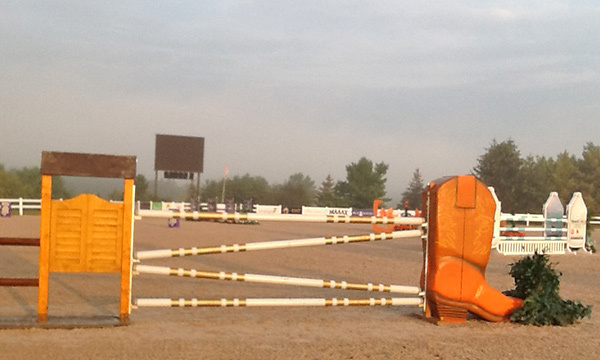 Welcome to Caledon Pan Am Equestrian Park and the Autumn Classic. 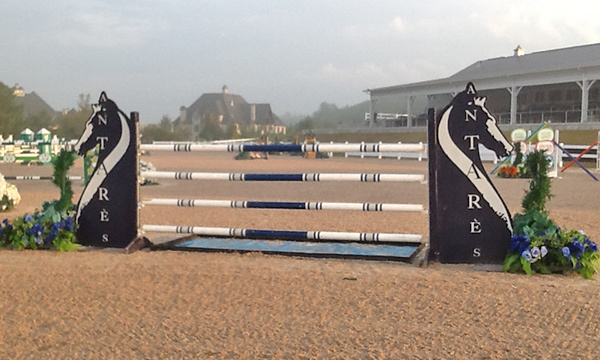 Today we host the Ram Equestrian 1.40m Grand Prix and the prize money is $25,000. I am going to spend some time on the classes this week in trying to explain why I think this type of class can be so difficult for the course designer. 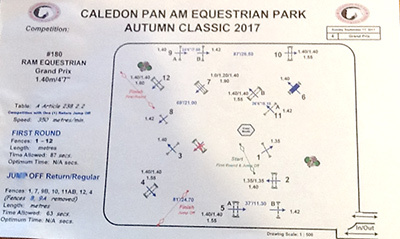 We had a large starting field for the Open Welcome on Friday, with 45 entries competing at 1.35m or 4.3ft and $10,000 in prize money. 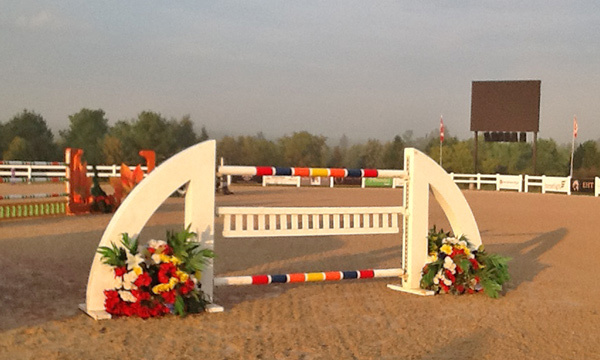 With a good group of mainly local (all of Ontario) and a couple of Canadian team riders, to achieve a solid number of clean rounds for the jump-off (25%) was a major undertaking. The final results gave us 11 clean for the jump-off. The course was specific to the heights and widths, and the speed set at 350mm was not in the course designer’s favour. These were exceptional results. The class today is not much bigger and the speed will remain at 350mm. With 38 entered in the grand prix, the difficulties of the Open Welcome are maybe more extreme than on Friday. 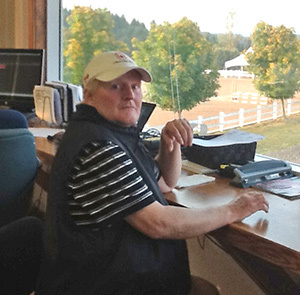 Our course designer for the week has been Chris Brandt (CAN). 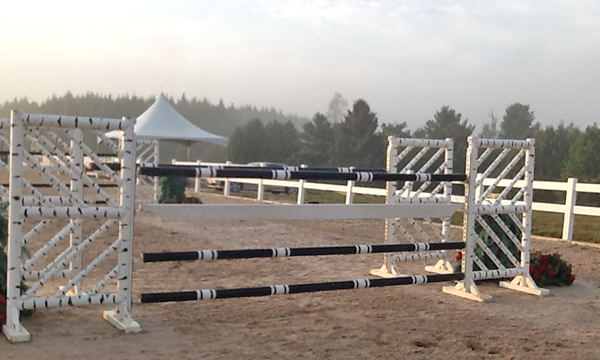 Chris a level 2 FEI course designer and heads the course design chair for Canada within Equestrian Canada. Mr. Brandt was also awarded the Official of the Year in 2015. I am doing something new today that I hope to include in these walks in the future walks when possible. 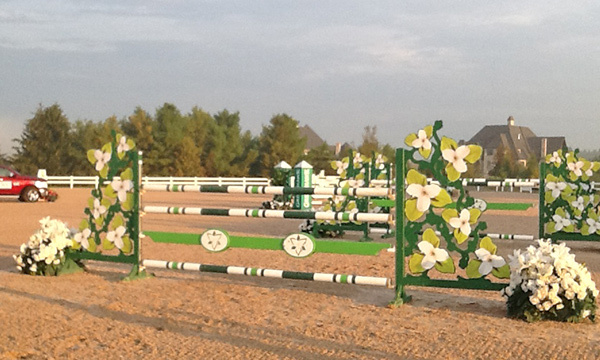 I will ask the course designer three questions about his or her approach to the grand prix course. 1. What tools will be the focus of your course today? Chris stated that he would not make the combinations difficult with the distances within the combinations. 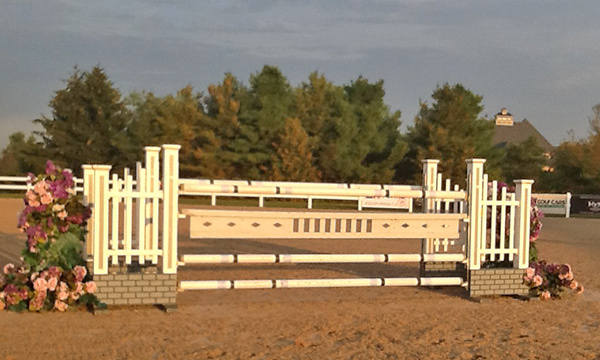 He would like to make the lines from fence to fence more technical and use some forward lines and some shorter distances. 2. Will the TA be a factor (350mm) and with the speed so soft, will you be more aggressive with the wheel? Chris will be more aggressive with the wheel, but we both agreed that the speed should be 375mm and that would make the course easier for the riders to read and make their ride easier to organize. It makes the wheel for the course designer easier by making the turns more normal and less aggressive to arrive at the same TA as with 350mm. 3. Will you be using some shallow depth cups? Chris was very honest and said that he would be using some of the shallow cups and for this kind of class this was the correct use of these cups. We both agree that these cups should be regulated and colour coded and properly manufactured. All equestrian ruling bodies should be more pro-active and soon, to eliminate the misuse of extreme shallow cups. We will now begin the walk of the $25,000 Ram Equestrian National Grand Prix. 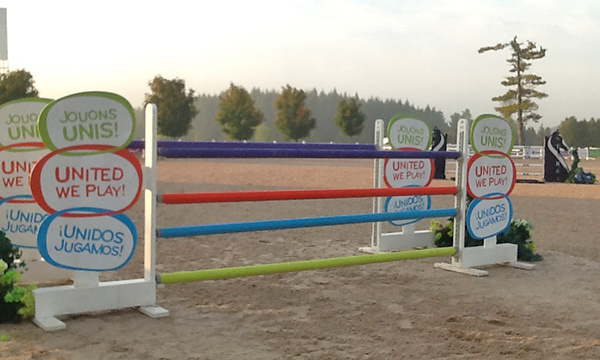 On the walk today we will see three double combinations, short pole vertical, Liverpool and a triple bar. We will not see a triple combination, water and no plank jump. There will be 12 numbered obstacles and 15 efforts. The TA is set at 84 seconds and will not be changed. #1 vertical. 1.35m or 4.3ft. 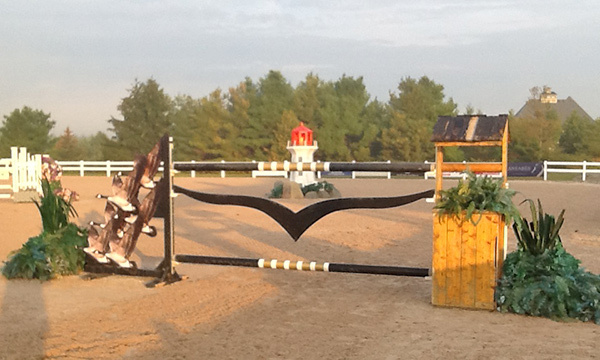 This fence very quickly ended the day for one rider. #2 oxer 1.35/1.40m or 4.3/4.6ft comes on the right turn away from the in-gate and greeted mother earth two times and saw one refusal. 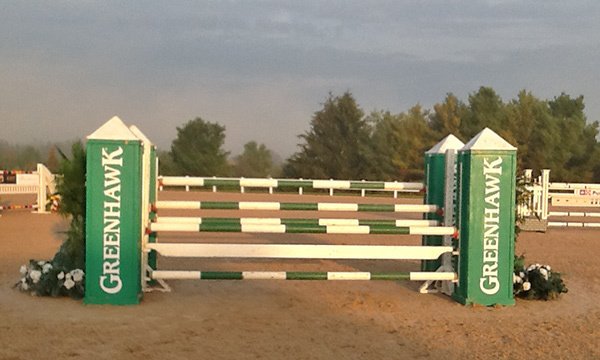 #3 vertical 1.40m or 4.6ft comes from #2 on the right bending line with no given distance and kissed the footing one time and created one refusal that eliminated one rider. 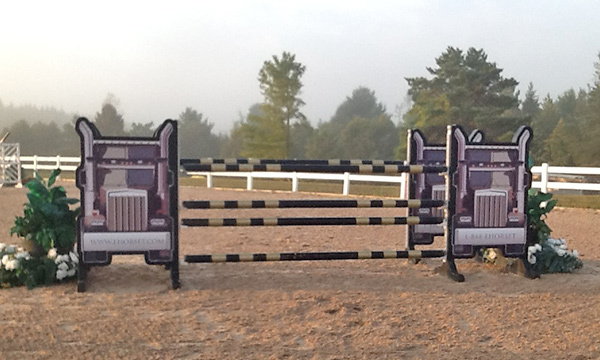 #4 oxer 1.40/1.55m or 4.6/5.1ft comes on a left turn and fell from the sky one time. #5a oxer 1.40/1.55m or 4.6/5.1ft comes from #4 with a left bend and on a distance of 24.7m or 81ft and tumbled to the floor five times. #5b vertical 1.42m or 4.7ft with a distance of 11.30m or 37ft from #5a and here we saw the top pole fall from grace two times. #6 liverpool vertical 1.40m or 4.6ft comes from #5b on a long gallop on the left rein and splashed down five times. 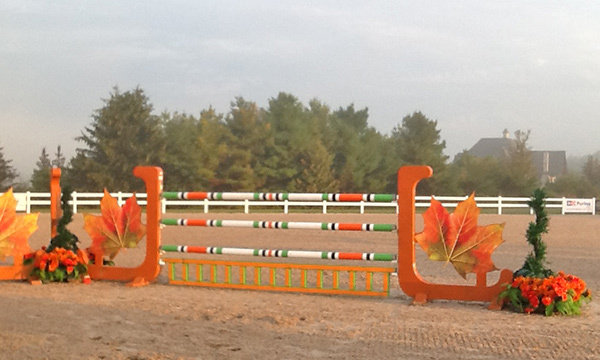 #7 triple bar 1.0/1.40/1.90m or 3.3/4.6/6.3ft comes on the continuing left rein and crashed down four times. #8 short pole vertical 1.42m or 4.7ft comes from #7 in a straight line and with a distance of 21m or 69ft and was pushed to the ground five times. #9a vertical (10ft poles) comes from #8 on the right turn and was removed from the top cups four times. #9b vertical (10ft poles) 1.42m or 4.7ft with a distance of 7.50m or 24.6ft from #9a and was faulted three times. #10 oxer 1.40/1.55m or 4.6/5.1ft comes in a straight line from #9b with a distance of 26.50m or 87ft and was the only fence on the course today that was never faulted. #11a vertical 1.40m or 4.6ft. The top pole was removed three times and there was one drive by. 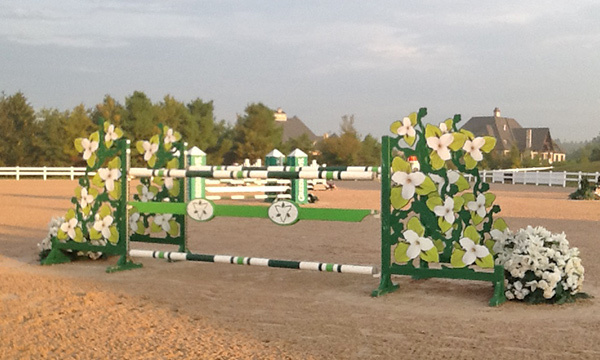 #11b oxer 1.40/1.55m or 4.6/5.1ft comes from #11a with a distance of 8.10m or 26.6ft and met mother earth five times. 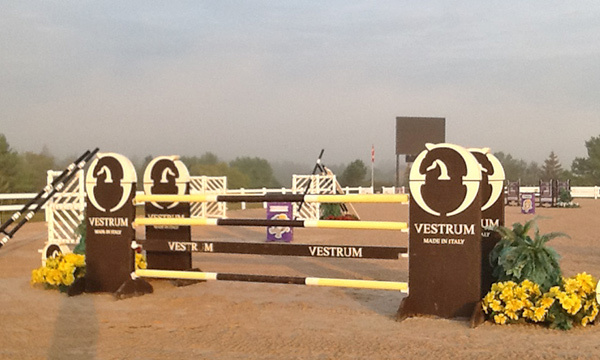 #12 oxer 1.40/1.60m or 4.6/5.3ft is the last fence on course today in the first round. At this point we saw two poles removed from the top cups and there was also one refusal. The final count in the first round gave us 11 clean, one round of one time fault and there were 11 rounds of four faults. The remainder of the field will compete again another day. There were no falls and there were no VW’s. There was one elimination based on refusals. Based on the restrictions of the class specifications and the speed of only 350mm these were really good results. My new count that is based on the number of faults created by vertical versus oxer we can see that the verticals were faulted 24 times and the oxers had 16. This is a much better distribution of faults between oxers and verticals than the last count of thee weeks ago. Chris has spent a long time in his career as a course designer working in the trenches with the regional grand prix and has been consistent with great results. At the beginning of this walk I asked three questions about his approach to building this class and you can see that he was spot on with his approach to have this result. The one comment I will make is that the TA was a little soft, but he was restricted by the speed of 350mm. One may say that the TA can be made tighter by shortening the wheel, but I would rather see the speed set at 375mm and wheel the correct track. Chris is in agreement with me on this. I would like to thank Chris for his honest reply to the questions that I put to him and it will be a regular part of the walks in the future. Next week we are back to FEI ranking classes and another walk.